In an earlier post we have covered how important it is for SaaS companies to get their metrics right if they want to grow sustainably and attain profitability. We have also talked about how to determine product market fit, a large part of which has to do with zeroing in on the right metrics and doing the math. Both these sales need different kind of strategies and tactics: while the former is not very different from traditional businesses the latter is directly proportional to customer success. For a profitable SaaS business you have to slash down the costs of customer acquisition as much as possible while increasing the average life time value of a user. Because of how the SaaS model is structured high growth SaaS companies, unlike traditional businesses might actually be operating at a loss. Assume that you spend $3000 to acquire a user who pays $500 per month. 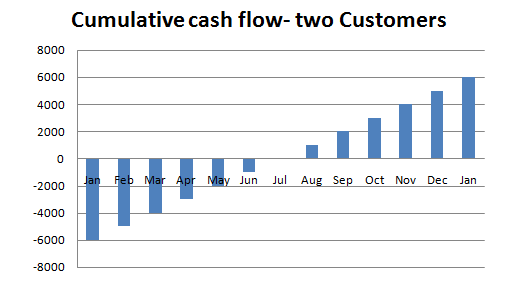 If your customer signs on in Jan it won’t be until Jul that you will break even. If at any point before Jul the customer quits you are in trouble as you have lost money off her. This trough gets deeper as you grow until there comes a time when you are making enough money off older users to fund new user acquisition, and you start turning a profit. This is why in the initial stages, as your growth rate increases you need more investment to keep things afloat. 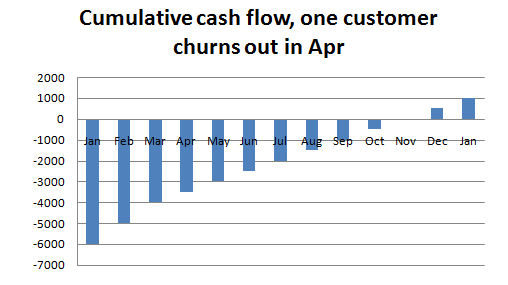 Now, there is one critical assumption in this model: there’s no churn. This means that none of your two users have left you. In the real world that rarely happens. Some customers might quit after a few months, even before you had the chance to recoup your customer acquisition costs. When that happens, profitability gets impacted directly. Notice how far back the breakeven point has been pushed? It’s Nov instead of Jul now. 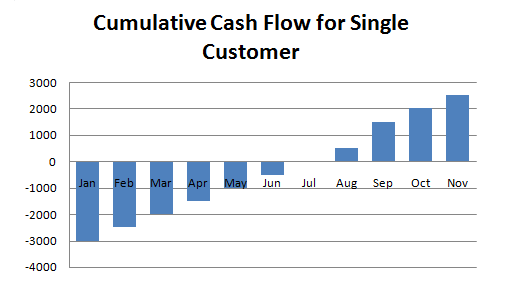 This time period is called payback period, also defined as the amount of time required to recover CAC. While your startup’s numbers will be infinitely more complicated there are three things you will still need to do in order to become as profitable as soon as possible. But even before you start number crunching keep in mind two rules of thumb that have been validated across a wide range of startups. Your customer life time value should be more than thrice the cost of acquiring customers, and you must recover your customer acquisition costs within a year. However as a marketer you will be more interested in specific channels as opposed to the overall CAC. The principle remains the same: you just have to isolate the spends on a particular channel against the number of customers acquired through that channel. 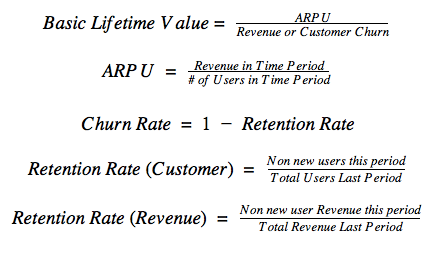 LTV and churn is closely linked, and they are in turn linked to another metric called ARPU (average revenue per user). Keep in mind one thing: none of the numbers that you would get from these formulas will be 100% accurate, because there’s no accurate way to measure all the inputs. Take the CAC calculation, for instance. It’s easy to determine the marketing budget but the numerator will also include hundreds of hours put in by your colleagues. And no matter how many tools (e.g. Kissmetrics) you use to determine the last point of attribution, the number of customers per channel will never be accurate. Take these numbers not in the absolute sense, and focus on the trends: monitor whether the CAC and churn rate is decreasing over time or whether the LTV is increasing.